The humble single leg squat. Feared and revered. Done by so many people around the world as a test of strength and a strength exercise. I have been teaching my patients variations of this for years - it is such a good exercise...but it isn't for everyone. 3. Safe progressions you can use so you can pistol with the best of them! Pistols are an advanced exercise that pops up in Crossfit workouts from time to time as well as at parties for bragging rights! In my experience, it is often BADLY done and I have personally knee cartilage damage to athletes who have done them incorrectly. Having said that, when they are done correctly, they form the basis for great weight lifting, running and agility. Doing Pistols properly will mean that you have good strength and control through the full range of your ankle, knee and hip joints. They look cool and few people can do them properly - a great party trick! At such a small knee bend, you can see this woman struggles to gain control of her whole body - This is a recipe for disaster! Twisting your hips and body to get your balance - sort all this out at a height you can control your whole body in. Doing them at a level that you are not ready for - this is by far the most common mistake. Swallow your pride and do them at a level that you can do EVERY SINGLE REP correctly. Wobbling around is not good for the cartilage in your knees. It takes longer to progress but believe me, surgery for your knees sets you back in the long run! Thanks to Jason Haywood from Crossfit BodyM for being our model! Perfect pistols! Note, for all of the progressions below, you can start the next level of progression so long as you keep it to a height you can do properly. That way, you will develop more skills in less time...otherwise you will be waiting a long time to master a full depth squat before moving one foot forwards! Listen to your coach, physical therapist, or other health professional you trust...but make sure they read this first! The next step is to lower with the other foot still just touching the ground for balance but then raise that foot and try to stand up from the height you stopped at. You may have to stop at a higher height to do this properly. GOAL - Full depth squat on one leg with light weight on the toes of the other foot for balance but can stand up on one leg without twisting. Lowering with control on one leg and raising up with control still on one leg. GOAL - No wobbling around, full depth Pistol down and then up. When you can do this, you have just completed a full Pistol! Aim to get at least 1 set of 15 reps at a certain height before lowering the box height or seat. How many reps should you do? As many PERFECT reps as you can. They are the only ones that count. I like my patients to start at 1 rep and work up to a set of 15 perfect reps before adding more sets. Ideally, 3-8 sets of 8-15 reps would be nice - very time consuming though! DO NOT sacrifice your form. Keep it PERFECT. Perfect practice equals perfect performance! Keep working at a height that you can do perfect reps in. Then lower the seat (or increase the plates under your feet) by only a few cm at a time. See point 1! I do not want to see patients who have hurt themselves due to their oversized egos. Swallow your pride and get it right first time. If you have any hints or tips about how you do your Pistols or if you have any questions about your form, please write a comment below. Thanks! my physical therapist is always pushing me to do these in order to help my knee pain but i find it very hard to keep my hips straight as my bum always pops out the side after a few squats and i lose my form, any advice in how to stop this from happening ? Hey Joe – sorry about my late reply – been busy! Without knowing anything about you, I suggest that you are going past the safe point of the exercise. Follow the progressions above. Value perfect technique highly. Perfect practice makes perfect. Address your weaknesses. Seek advice from someone in your area who will help you achieve your goals, not make you do gazzillions of them or tell you not to do them. There are very few people who can do these to my satisfaction…so i don’t expect many people to be able to do them at all! Hi Chris, I can see what you mean. However, the lady demonstrates good hip strength by having her knee out with her hip, not vertical over the ankle. By anatomy, women will have more of a difference in distance between the heel and hip when standing on one leg – they usually have wider hips. It is whether you can control the hip that counts most – you can see that she looks really comfortable and everything is aligned nicely in the cardinal planes. The man doing them off the box does not have the hip strength to maintain the knee outside the ankle and so will rotate on the knee joint a lot. If we just go by looking comfortable and aligned – aka totally unscientific – Jason and the lady “Zuzanna Light” look much more aligned and comfortable and “right” compared to lots of other photos out there on the Internet. Thanks for the observations. I hope the blog post helped. Thank you very much for this blog post. It helps me a lot. It is quite bizarre actually. Movements that are often labelled safer than others hurt my right knee more than those that are often classified as harmful. For example, box squats and low bar back squats where I sit back actually hurt after a while. On the other hand, front squats where I sit more down than back feel much better. And no other exercise seems to help my knee more than the properly performed pistol squat – yet some coaches argue it hurts the knee more than it does them good. I rather listen to my body, and the pistol in my opinion is just a great exercise. Thanks again! All the best, and God bless! Hi Ted. Thanks for that. Great link! Thank you very much for the quick reply and the generous offer. It is indeed a strength imbalance that is causing my problems. For this reason I have scheduled a session with one of Charles Poliquin’s students as they put a lot of emphasis on structural balance. In your experience and opinion, does Poliquin know what he is talking about? He seems to be quite a rule breaker. For example, the vast majority of coaches and phyiscal therapists suggest when squatting to either break at the hips first or to break at the hips and knees simultaneously. Poliquin, when coaching the high bar back squat, actually advises to initiate the movement by breaking at the knees first. It’s hard to know who to believe. But I would trust your judgement. What is your take on that, if you don’t mind me asking? I do not have a quality camera handy at this point. May I get back to you about this matter in a few weeks after the Poliquin guy worked with me? Hi Ted. In general, breaking at knees first is less preferable because it loads up that Patellofemoral joint earlier. Having said that, it may be right for you. Also having said that, sometimes people say things but mean something different. Bottom line is that you have to do what is right for your body. You should know if it is right nearly straight away. Thank you, Antony, this makes a lot of sense. Thanks for all you do. Your site is awesome. Hi Ted. Thanks for your kind words. His form was nice. He actually flexes at hips and knees simultaneously (or near enough to it). I would consider this to be fine and ideal, especially with 200kg on your back 🙂 It is unwanted shear and rotation that we want to cut out. And progression at a rate that allows your cartilage, ligaments and tendons to cope (they grow and adapt a lot slower than muscles). If he is being held up as someone who bends his knees first, I wouldn’t say it was so bad. I mean starting your squat from the dip position as if you were jerking….that is not how to start a squat! My apologies for the misunderstanding. I know English as a second language only as I am German. I try my hardest. Please bear with me. I think I know what you mean now: I perform the front squat similar to Dabaya. Always thought I was breaking at the knees first (by definition, common understanding). Didn’t realize people had quite an exaggerated knee break in mind, as in a Jerk as you said. This is not ideal, right? Klokov obviously pauses for quite a while. He does not come straight up but brings his hip back first a bit. Do you think he does this to load his hamstrings or does he have relatively weak VMOs and has to use this trick around that? Thanks again. I hope I am not demanding too much of your time. I really appreciate you taking the time off your busy schedule to help out a complete stranger like myself. Apologies for the delay in getting back to – it has been a bit hectic! 3rd video is not too bad but he won’t lift a heavy front squat if he keeps leaning forwards like that! Good luck with the lifting! Thank you very much, Antony, for your kind words and the highly interesting pieces of information. I appreciate your efforts. I am often told German is hard to learn. Maybe learning a hard to learn language first as mother tongue makes learning a second and third language easier down the road. Again, thank you very much for all you do. Awesome website, and I can easily tell you know what you are talking about (which, unfortunately, nowadays is rare on the internet). Thank you for your kind words Ted. Part of the reason why I took to the internet was because of a lot of dubious information. Admitting to one’s own limitations is one of the most responsible things one can do. I like your way of thinking. I’ve been researching the squat for a while as I want to start developing my posterior chain. With safety in mind (I’m currently studying to be a physio), I have been a little deterred from performing back, or even front, squats due to damage that could occur to the back. Also, I believe from a functional standpoint they are not as effective due to an inability to effectively load the legs due to the back being weaker and therefore less weight can be loaded because of this. Not to mention many, if not most, sporting movements are made contracting from a single leg. Additionally, I’ve always been told not to go past parallel with the femur. The pictures you have of the guy doing a pistol loaded with a kettlebell seems like it would incur a lot of strain on the knee (maybe to the ACL/meniscus). Is this not so? Please let me have your thoughts on my comments and thanks for the blog. P.S. are back squats safe in your opinion? Mike Boyle is a S+C coach and I like how his training is very safety conscious. 1. Beliefs about safety. I don’t believe that anything is 100% safe. So things increase your risk of injury a lot, other things don’t increase your risk of injury much. Some things will decrease your risk of injury when compared to how you usually do things. 2. What is your posterior chain? When I hear that, I think of all the posterior muscles from the very bottom of your toes to the very front of your forehead…yes, some coordinate in a chain-like manner but the body is a web, not a series of chains. Why do you have this idea that you want to start developing your posterior chain? What is the purpose of that? 3. Damage can occur to the back in simply putting your clothes on…are you going to stop putting clothes on because of the risk of injury? Getting up off a lunge chair is like a squat. Why wouldn’t you use progressive overload to improve your strength and control? SAID principle – specific adaptations to imposed demands…if you truly believe the human body is that fragile, than womens shouldn’t give birth and people shouldn’t run or jump or do stairs etc etc. That is a dangerous game to play…especially with me! 4. So squats are not that functional? Tell why do 4 billion people (at least) around the world squat over a hole to open their bowels? Have you ever tried to pick up something heavy? Sometimes you need a deadlift, sometimes you need a squat, sometimes you need both. 5. You say that it isn’t as effective…as what? 6. Because the back is weaker than the legs therefore less weight can be loaded…do you think that squats are for the legs only? Why not use them to develop your back strength? 8. 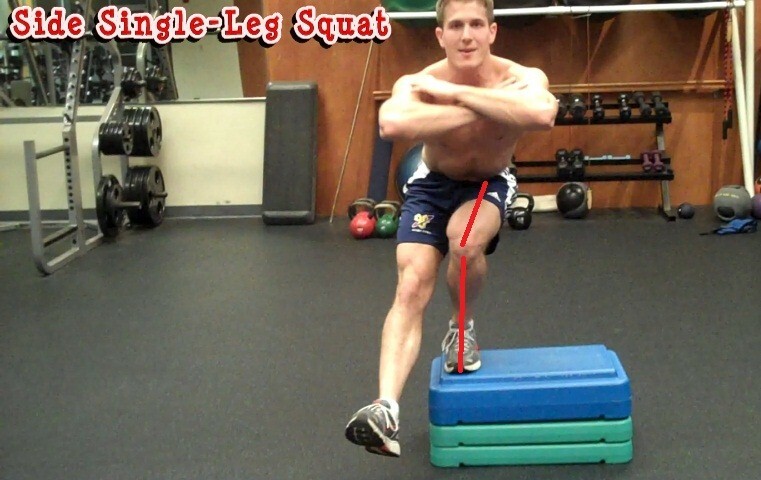 Bulgarian or Rear foot elevated split squat – would I agree this is more efficient? No. It is just a different stimulus and one that I teach. Have you tried to do a pistol squat – it is an advanced movement and difficult to do if you don’t have mobility, flexibility, control and strength. It requires skill. It requires 3 dimensional control of the whole body. 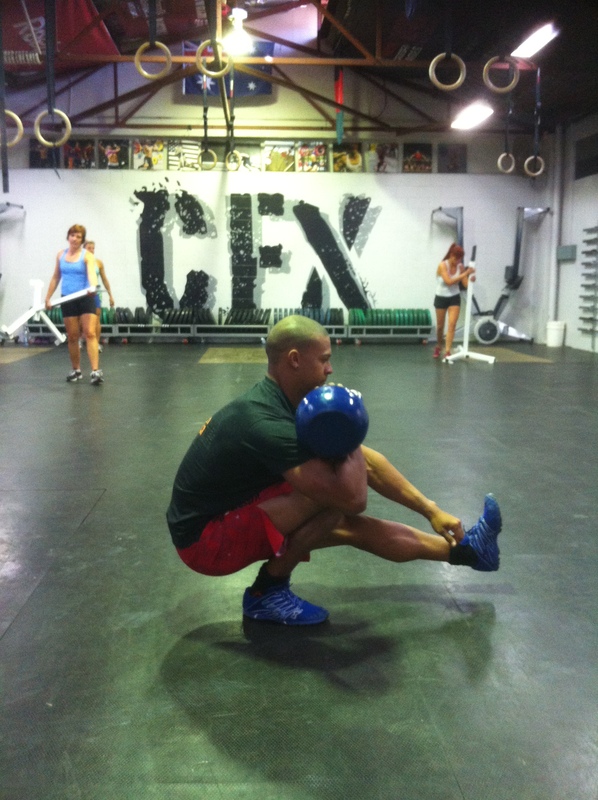 Your Bulgarian split squat is just a lunge…it doesn’t translate into being able to stand up on one leg. 9. Sure, there is a lot of strain to the knee…so why did God make your knee bend so much? So you can stop bending it past horizontal? If you can move it there, why can’t you strengthen it there? Does it increase the risk of injury – sure. Is being weak and then trying to do something like that going to increase your risk of injury? Definitely. I prefer to choose MORE options to do things in life, not less…develop with control and you will get stronger. Just being overweight is increased pressure on the knees…50-70% of australians are overweight…if you want to decrease the risk of injury for people, start there. 10. Yes, back squats are ok. Most things are ok. But it depends on the individual. I wouldn’t give a guy with 3 bulging discs and in pain loaded back squats…yet…but the movement pattern is a good one. Obviously risk is inherent in most activities. By posterior chain (although the term may be quite loose, but is generally used to mean the hip extensors) I meant particularly the muscles of my lower back, glutes and hamstrings. I want to focus on these as they are the muscles I neglect the most out of my exercise regime. Deciding whether the back squat was what I should be doing was one of the uncertainties I had, but is the exercise I wanted to incorporate. When you talk about the range of movement the knee (with the SLS) can provide it makes sense that strength development can be exercised there as long as it is controlled, as with most exercises. Sometimes, wanting quick results is what results in the injury and not necessarily the exercise. Just having your input from a physiotherapy stand point makes me feel more confident about performing the exercise. If you mean hip and back extensors, then you should say so…you are training to be a physiotherapist. Believe me, any terms that contain ambiguity should be used cautiously. Back and hip extensors are worked more in a Deadlift but the squat should be there too. Control is at the heart of what I teach. Hi there! I am a 21 years old female and I started to train my pistol squat 1 week ago. I have the exact same problem as the man on the last picture (bad hips control). I have no problem with my two leg squat, but with the pistol it’s another game. How can I correct it? Hi, thanks for the article. I find that when I do pistols on my left leg my right leg wants to rotate outwards as I come up, especially in the first few inches. It doesn’t feel like a coordination problem so much as something mechanical. I think I need more range of movement somewhere to correct this, but am not sure what to stretch – any tips? Thanks Antony. I tried to get some video in the gym but it’s just not practical unfortunately. It doesn’t help that I said ‘outwards’ in my original post, when I meant ‘inwards’. The problem seems to be connected with a feeling of tightness at the top centre of the quad of the leg I’m *not’* standing on – this probably isn’t enough detail, but thanks anyway. By the way, on the alignment issue discussed above, I think it’s useful to go back to the principle that any freestanding structure will fall if its centre of mass is outside its footprint, unless there is some horizontal force acting on it. In other words, if you are going to stand on one leg, then – regardless of how strong you are – you have to move your centre of mass over the foot that is supporting you. The girl in the Bodyrock photo has to have her hips over, or she will fall. 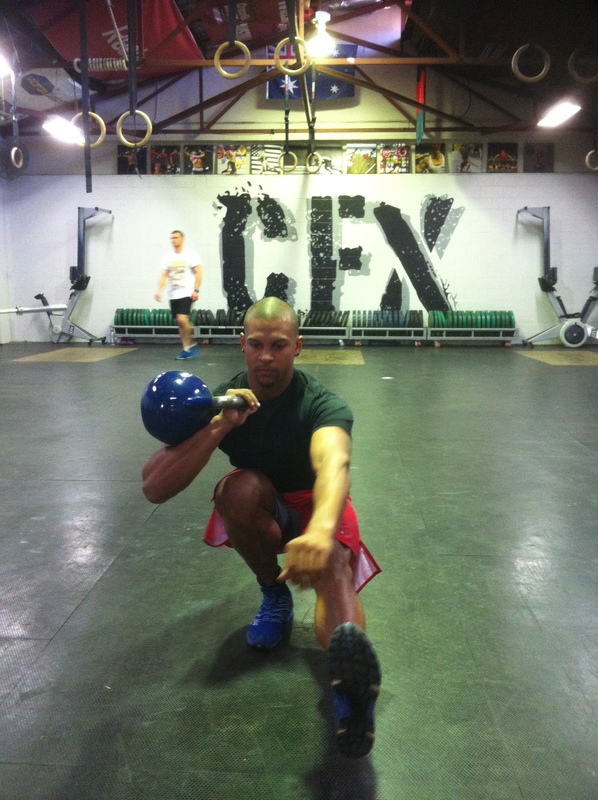 The reason the guy in the CFX photo doesn’t need to do this is that he is holding a kettlebell over to one side, and that does the job of moving his centre of mass over. Assuming we are not using kettlebells, we need to make an angle somewhere, and it seems to me the only question of form is how much of this should be made at the hip and how much at the knee. Personally I think it would be pretty unnatural to have the knee dead straight and make all the angle by dropping the hip on the side you are not standing on. Anyway just my 2c. Hi art. Thanks mate. When you can, just pop the video up or a link. My goal is to do pistol squats but I am struggling…. When I try, my leg from my hip goes inward… Is this due to weap hips and glutes or what is the proper terminology? Also I am a pear shaped woman, does body shape factor in this? I find it hard finding on google images or videos of a front on view of women doing pistol squats as I want something to compare myself. Last question, if i have weak glutes or hips how long does it take for them to get somewhat better and more stable? Hi Jay – it is hard to say without seeing a video of you from the front and side. Perhaps you can go on Facebook at http://www.facebook.com/physiodetective and put up a video and I can take a look. They are good for you but work with your PT to ensure you get all the exercises you need including pistol squats. Ideally your PT should be able to teach you how to squat and deadlift and do WHATEVER you want. Thank you Anthony for your answer, it truly made my day. Alas, I have no access to the really well-informed PT sportspeople. All PTs I have encountered don’t practice sports themselves, are all flabby and physically inactive–save for the walk to work and house chores I guess. But it’s good to know that all I need is a good sports scientist to resolve my issue, that it’s not a no-workout sentence for life. Thanks again! The best would be to go to Facebook.com/physiodetective and post a video if you want some advice. For the pistol, don’t worry about the rounded back because it is rarely loaded heavily. Regular squats though need some checking.